Meryl Streep, the Takacs Quartet, and Philip Roth aren’t names likely to be seen together, much less people found in the same concert hall. 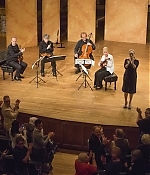 Yet Princeton University Concerts presented all three in Richardson Auditorium on Friday evening, with the quartet playing Arvo Pärt and Franz Schubert, Streep reading extensively from the 2006 novel Everyman, and its author, Roth, listening in the audience – in a one-time-only event that guaranteed a packed house. An in-depth article can be read here, two pictures have been added to the image library. Thanks to everybody for the heads-up. 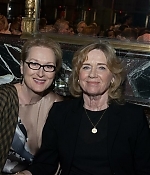 Meryl has attended the New York premiere for “My Old Lady”, starring friend and colleague Kevin Kline, and co-starring Maggie Smith and Kristin Scott Thomas. 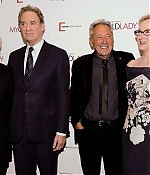 Streep and Kline were joined on the red carpet by another friend, Glenn Close. In the film, directed by Israel Horovitz, Kline plays an American who inherits an apartment in Paris that comes with an unexpected resident. Pictures from the premiere have been added to the image library. 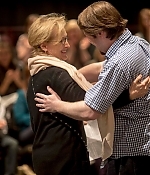 Artists from three media will come together for a special event at Princeton University’s Richardson Auditorium on Sept. 19, as three-time Academy Award winner Meryl Streep joins the Takács String Quartet for readings from Philip Roth’s novella, “Everyman.” The readings will be interspersed with music by Franz Schubert and Arvo Pärt. The concert will take place at 7:30 p.m. The event is already sold out (in less than 12 hours); however, obstructed view seats will be put on sale on Sept. 2. In the unlikely event there are remaining tickets, they will be made available for purchase after Sept. 2 at the Frist Campus Center Box Office, at (609) 258-9220. As described by The New York Times, Roth’s “Everyman” is the story of “a nameless, multi-divorced advertising man in New Jersey grappling with family estrangement, illness and death.” The event will be presented by Princeton University Concerts, which will also collaborate with the Princeton Adult School to offer a two-session course on Sept. 15 and 16, exploring the themes of Roth’s novella. The complete announcement can be read here. Many thanks to Glenn and Rachel for the heads-up. 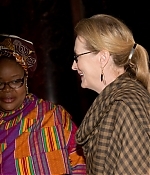 On Saturday, Meryl Streep and Jodie Foster joined forces at the Jacob Burns Film Center, where Jonathan Demme was presented with the 2014 Vision Award for his remarkable career as a director, producer, and screenwriter, as well as his significant involvement in the JBFC’s film, education, and outreach programs. 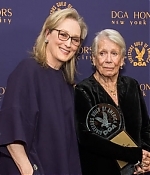 Foster won her second Academy Award for her performance in Demme’s “Silence of the Lambs” (for which Demme won Best Director) and Streep played Eleanor Shaw in his 2004 of “The Manchurian Candidate”. The Jacob Burns Film Center is a nonprofit cultural arts organization that aims to present the best of independent, documentary, and world cinema, promote 21st century literacy, and make film a vibrant part of the community. 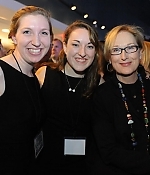 Update: A video esxcerpt of Meryl’s speech, as well as additional pictures have been added. Yesterday, Jane Fonda was honored as the 42nd recipient of the American Film Institute’s Life Achievement Award by a star-studded crowd that included Michael Douglas, Sally Field and Meryl Streep. Accepting the American Film Institute’s 42nd Life Achievement Award, Jane Fonda exclaimed, “I’m so happy to add another woman’s name to the list.” Pictures from the ceremony have been added to the image library, with additional information below. Fonda also offered a bit of advice for the roomful of Hollywood celebrities gathered at the Dolby Theatre in Hollywood Thursday night: “Ask questions, stay curious,” she exhorted them. “It’s much more important to be interested than to be interesting.” In recounting both Fonda’s career as well as her very protean life, those who gathered to pay her tribute – especially a blue-ribbon acting sorority led by Meryl Streep, Sally Field, Lily Tomlin and Sandra Bullock – certainly made the case that Fonda had been plenty interesting herself. 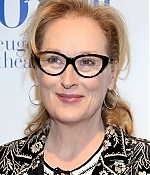 Streep, who made her film debut in a supporting role opposite Fonda in 1977’s Julia, offered one of the evening’s most memorable descriptions, when she recalled her initial impression of the older actress: “She had an almost feral alertness, like this bright blue attentiveness to everything around her.” And she thanked Fonda for showing her the ropes. 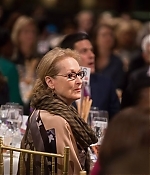 On May 01, Meryl Streep attended the Women’s Refugee Commission 25th Anniversary Voices Of Courage Awards luncheon as a guest speaker. 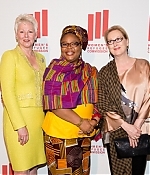 Held at New York’s famed Cipriani restaurant, the event honoured three remarkable former refugees: Liberian Nobel Peace Prize Laureate Leymah Gbowee, Sierra Leone’s Chernor Bah and Mary Tal from Cameroon. Pictures from the event can be found in the image library with more information, and additional gallery updates, below. Edit: Additional pictures from the Voices of Courage Awards have been added, plus a picture from last week’s Poetry & the Creative Mind with thanks to Joan for the heads-up. 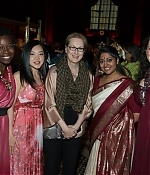 Meryl took the time to pose on arrival with peace activist and one of the event’s honorees, Leymah Gbowee, as well as Women’s Refugee Commission board member Jocelyn Cunningham. The Women’s Refugee Commission is a research and advocacy organisation which aims improve the lives and protect the rights of women, children and youth displaced by war, persecution and natural disasters. Alongside the new additions, pictures from previous events have been uploaded as well. Many thanks for Claudia for sending in some of the Monte Christo Award additions. 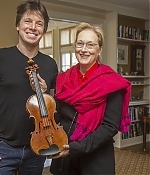 Meryl Streep and Neil Young will help pay tribute to Hollywood heavyweight Jonathan Demme at The Jacob Burns Film Center (JBFC) in Pleasantville on June 14. 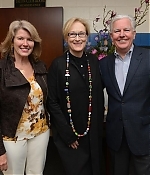 Streep will present the JBFC Vision Award to the legendary director of films including “Philadelphia” and “The Silence of the Lambs.” The Westchester resident will not only be recognized for his Oscar-winning work, he will also be celebrated for his ongoing involvement with the nonprofit cultural arts center. “Whether working with students at the Media Arts Lab, mentoring our faculty and staff, hosting our monthly Rarely Seen Cinema series, or serving on the JBFC Board of Directors, Jonathan’s impact on the Burns has been nothing short of transformative,” the center said in its announcement. “We are joyful and grateful for this opportunity to publicly thank and celebrate Jonathan for his many contributions to the JBFC and world of cinema.” Neil Young and other special guests will also participate in the tribute, which will be part of the Jacob Burns Film Center’s 2014 Anniversary Celebration. The event, including a cocktail reception and seated dinner, will benefit the center’s film, education and outreach programs. To learn more about invitations and tickets, visit the Jacob Burns website. Many thanks to Glenn and Frank for the heads-up. 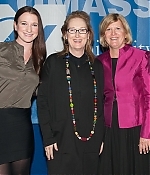 Meryl Streep was honored with the Eugene O’Neill Theater Center’s Monte Cristo Award on Monday evening. 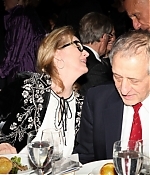 “I’m glad to see some old friends and celebrate this wonderful theater — it’s a home for new playwrights, writers, musicians, it’s a rare sort of conservatory for new talent and ideas,” she told reporters at the Edison Ballroom in New York City of the organization where she first worked as an actress after graduating from the Yale School of Drama. Lots of pictures from the arrivals and the ceremony have been added to the image library, with additional information on the honor below. The Hollywood Reporter has an in-depth article on the evening. Judith Light shared sentiments on behalf of the late playwright Wendy Wasserstein, the past Monte Cristo Award honoree who featured Streep in Uncommon Women and Others: “I wish that Wendy were here with us tonight…she would be here, because she loved Meryl so much. 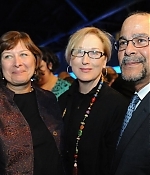 Meryl, whom she regarded in the deepest respect and loved; Meryl, who is a very uncommon woman.” The evening also included tribute clips from playwrights of many stage projects Streep helped bring to the big screen. Angels in America’s Tony Kushner recalled that he eventually finished writing a new translation of Mother Courage and Her Children, and on closing night, “after I fumbled my way through my attempt to describe how magnificent she’d been in the role of Mother Courage, she said, ‘Thanks, this was a wonderful series for me, I’m so glad.’ We hugged, and then she added, ‘And just think how much greater it could’ve been if you had delivered the script on time!’ ” He also admitted that the line “There are four points on a compass, and I’ve been pricked in every direction” was a result of Streep’s improvisation. The complete article can be read here, more information and video clips will be posted next. 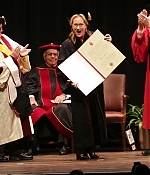 On Thurday, Meryl Streep became Indiana University’s newest alumna when she accepted an honorary doctoral degree from the Bloomington school Wednesday afternoon in front of an enthusiastic sellout crowd of 3,200 at IU Auditorium in Bloomington. 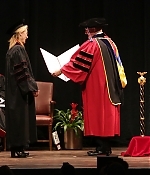 The brief ceremony was all pomp and circumstance—Streep donned a velvet-trimmed IU cap and gown as a procession of four trumpeters welcomed her onstage, and she received a standing ovation when IU Cinema director Jon Vickers presented her with a red leather-bound Doctor of Humane Letters diploma. 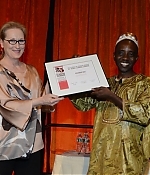 Streep accepted the award for her work as a role model and humanitarian in the arenas of women’s rights and social justice. 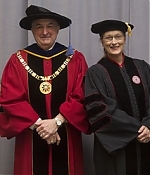 IU provost Lauren Robel spoke to the selection, saying Streep was an “inspiring choice,” nominated for her “generous spirit and utmost sincere concern for public good.” There have been quite some appearances from this day – besides the Honorary Degree, Meryl has attended a panel at IU Cinema as well as a Master Class at Wells-Metz Theatre. All pictures can be found in the image library with more to come. 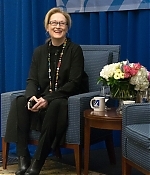 Yesterday, Meryl has (finally) been a guest at the UMass Lowell’s Chancellor’s Speaker Series. Her appearance was originally planned for February 05, but got postponed. She answered questions, reflected on her storied career, offered advice for breaking into films, posed for countless photos, pulled an April Fools’ prank before a crowd of 3,600 and raised more than $230,000 for scholarships. Pictures from the event have been added to the image library. Scroll down for more information and a video. Edit: Pictures from the Q&A, which took place before the evening’s conversation, have been added as well. 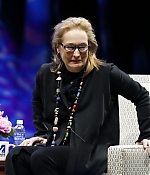 Streep held court before a capacity crowd at the Tsongas Center in an event billed as “A Conversation with Meryl Streep” that was moderated by Assoc. Prof. Andre Dubus III. 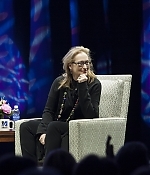 Earlier in the day, she held an hourlong question-and-answer session with 100 English and Theater Arts students at the UMass Lowell Inn & Conference Center, touching on subjects from how she prepares for roles to how she got her start as an actress. 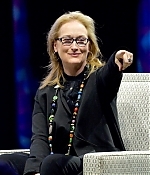 By turns witty, thoughtful and quick, she held her audience rapt as she discussed her career. Dubus, a New York Times bestselling author, wanted to know how she is able to disappear into her roles. 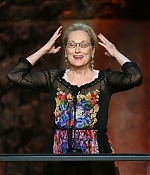 “Acting is a very mysterious craft,” Streep said. “The (actors) I admire, I have no idea how they achieve what they do. When you are working with them there’s a seamless exchange of thought, emotion and physicality. You can’t parse it when you are in the moment.” UMass Lowell has posted a video with highlights from the conversation, which can be watched in the video archive.